I am tempted to start this post with "WOW" but part way through the first sentence will have to do. All the same, Buck nailed the Spitfire, hard. I prefer to write more of a user review, after I've had time to find out if whatever it is is actually any good. At the same time, I don't like to get into technicalities and specifications or tell you something you can just read on the manufacturer website. So, this review is going to be more like the Schrade SCHF10 review because my Spitfire just showed up today. Also, I like it and think that the web is lacking interesting pictures of it. In some small way I'd like to be able to give more people a reason to get this knife if it is something they are interested in. I suppose all reviews ultimately serve that purpose and right now there just isn't much out there covering the 722. I know there are a few youtube videos and they helped me make up my mind, but I wasn't this excited until I had it in my hand and with any luck, some of my pictures will convey with a little more clarity, why it is so good. 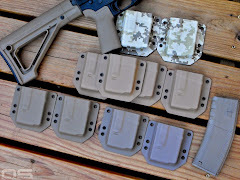 I get excited when a company designs a product as if they simply asked enthusiasts what they wanted, then told the folks in the back to start cranking them out. There are almost no misses, the way I see it, with the Buck Spitfire - except maybe the name. I think it may become known as the Buck 722 because I don't see the Spitfire thing, or simply didn't do enough research to get it. Probably the latter. But like I said, if you want to know why Buck called it the Spitfire, ask Buck. 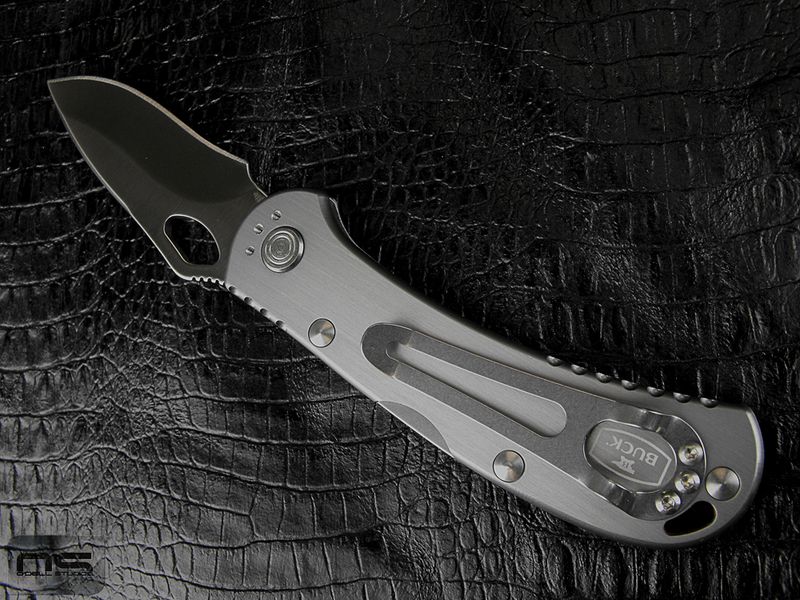 This is a pure EDC knife and it is a budget review because I gave exactly $31.99 shipped. Let's get started. I've got lots of pictures. First things first, yes I admit it, I bought it because it goes with this light - you'll see why. I love the bright blade and hardware against the brushed grey anodized handles. Perfect size, perfect blade shape, perfect overall appearance. 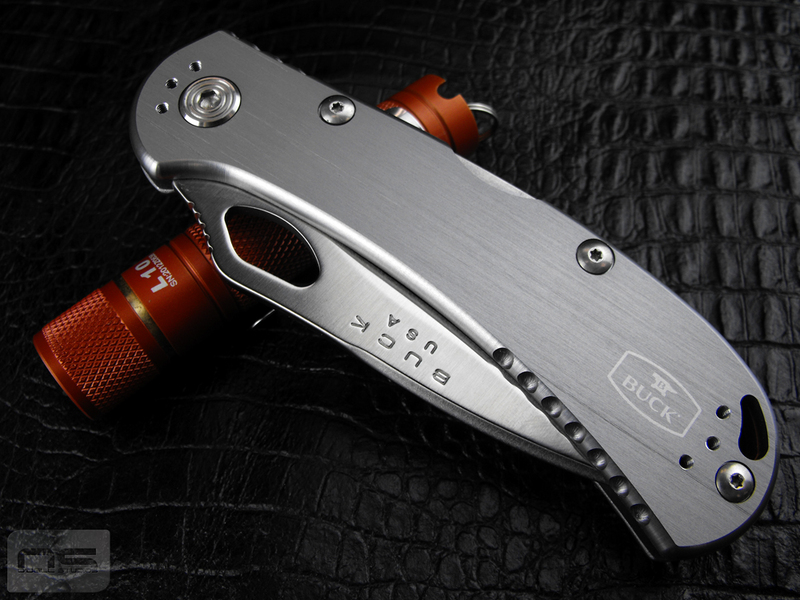 As I said, this is a pure EDC knife. It's very light weight, slim, functional and also attractive. 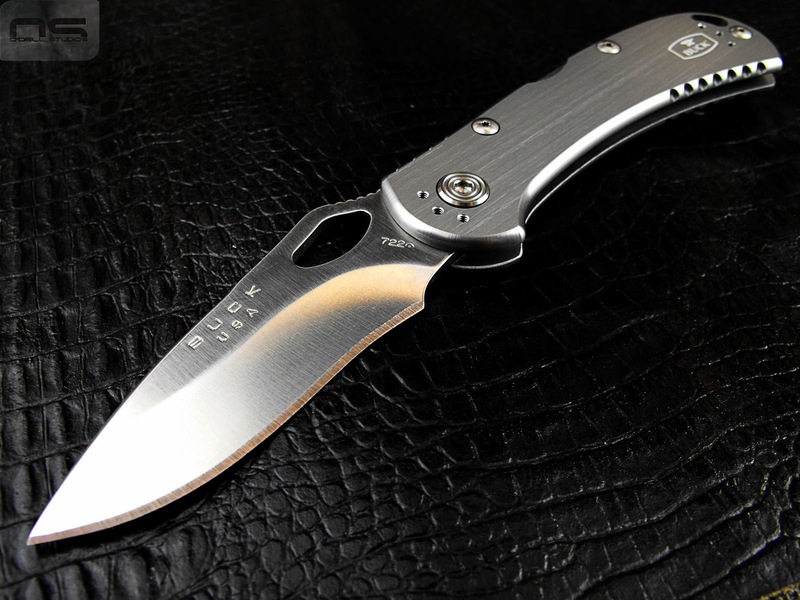 That blade is razor sharp as Buck knives tend to be, right out of the box. I keep my knives sharp enough to easily remove arm or leg hair, but this thing is sharper still. Just look at that. I know I'm not a flashy person and when I saw they added just a little accent color, I had to have one. If you want to go loud they also come in full bright green and orange handles with alternate accent colors. It's just the right amount of personality in my book. It is also minutely recessed which I suspect will prevent the color from wearing over time. It's a lock-back which might be a miss for some people. I suspect this may have been a price factor, yet at the same time it's simple, classic and time tested, so it could have just as easily been purposefully included. For me personally, it works. I doubt I would have liked it more with a frame or liner lock, mostly because the knife looks very clean this way. And take a look at that pocket clip. For one thing it came right side, tip up. Buck has been paying attention. Further more, it can be moved to either tip up or down, left or right side. And most importantly it is very well designed. I really like how much contact it makes with the handle while at the same time having medium tension. What this means is it slides into and out of the pocket very smoothly. The extra hump at the top accommodates the folds in the fabric and the hole neatly surrounds either the Buck logo, or the pivot depending on how you carry yours. Some thought went in to this clip. Some of the little details. Fit and finish are amazing just like that jimping. This jimping is worth bragging about. The round cuts are left sharp and work even better than they look - a unique feature that is functional. The traditional jimping on the blade is rounded on the sides with the rest of the blade, but the lateral edges are left sharp. Bottom line, the jimping is the absolute perfect balance of bite and comfort and a thumb ramp to boot. Nothing was left out here. I love it so much I'm going to make you look at it some more. But here you can see the blade jimping is crisp where it matters. The blade has a beautiful satin finish and rounded spine. The thumb hole once again strikes the correct balance between crisp edges your thumb gets traction on, but not so much as to wear on you. It is also ideally located. The blade opens one handed and is smooth as glass thanks in large part to this highly polished surface which contacts the lock. 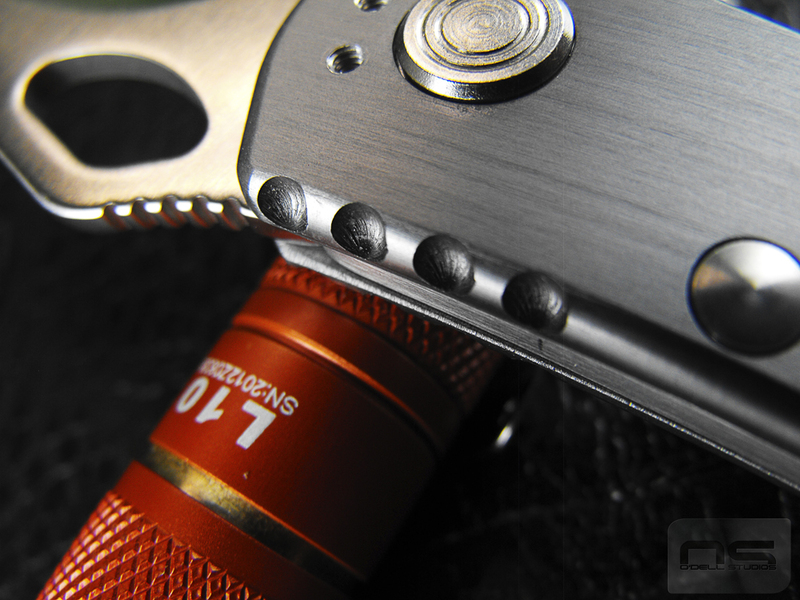 This knife has class, and tradition behind it so there is no call for assisted opening or thumb studs. It is very slim, the absolute perfect size and very nicely put together. For size comparison. I find myself carrying the Cryo a lot. I love the size and I love the smooth looks. The Spitfire takes those looks up a couple notches with a sophisticated flare. These are both big bang for your buck blades except the Buck is made at home. So if I didn't make it clear, the bottom line on the Buck 722 Spitfire is balance - the flawless balance of function and beauty. Every single aspect of this knife was considered in both appearance and utility, not just one or the other and without compromise to one or the other. 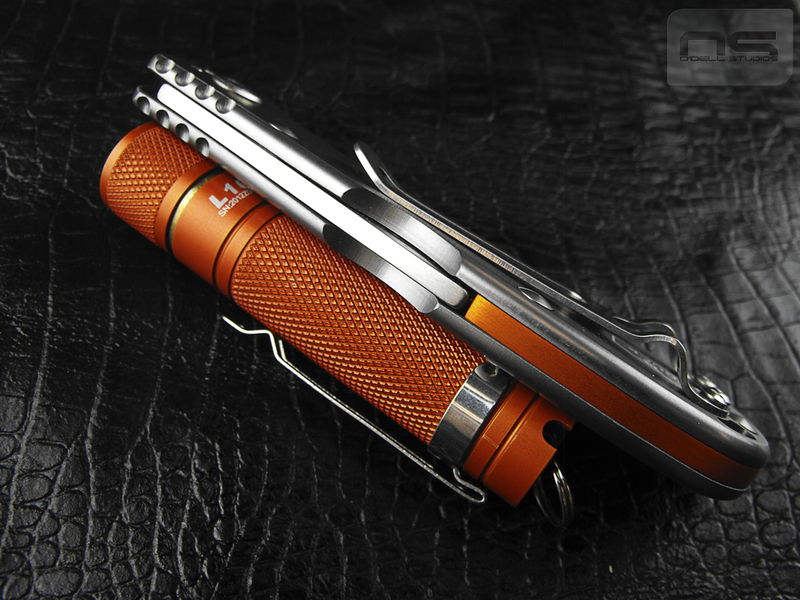 The unique jimping adds the final touches to a stunning knife but is still perfectly useful. 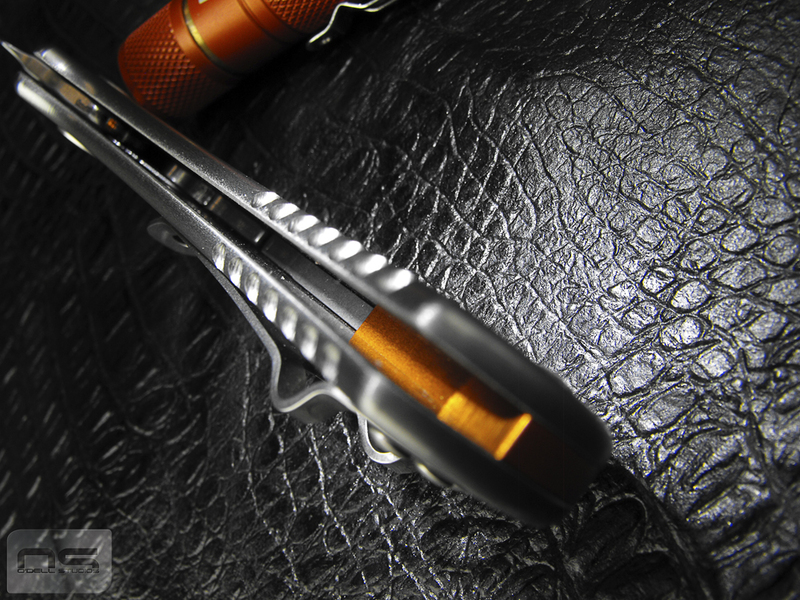 The pocket clip isn't just 4 position adjustable because lots of knives are made that way, in each position the clip still looks right in the knife's design. 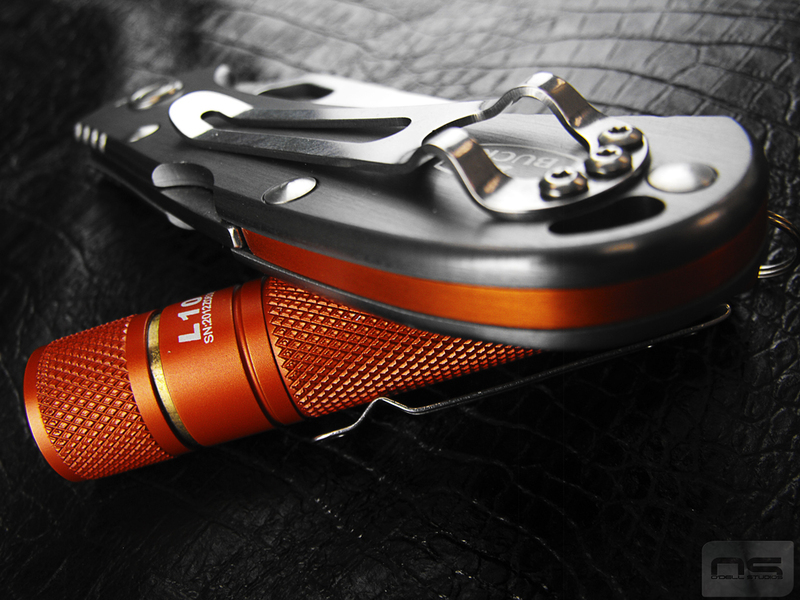 The finish, the accent (mild to wild), the bright finished hardware and attention to detail on the blade finish. 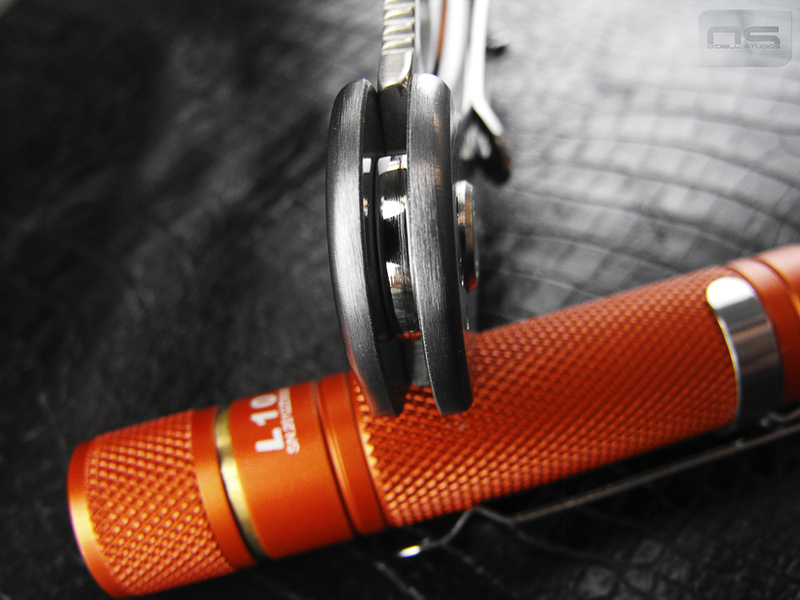 The polished lock contact surface. The absolutely perfect thumb hole. The weight and width. 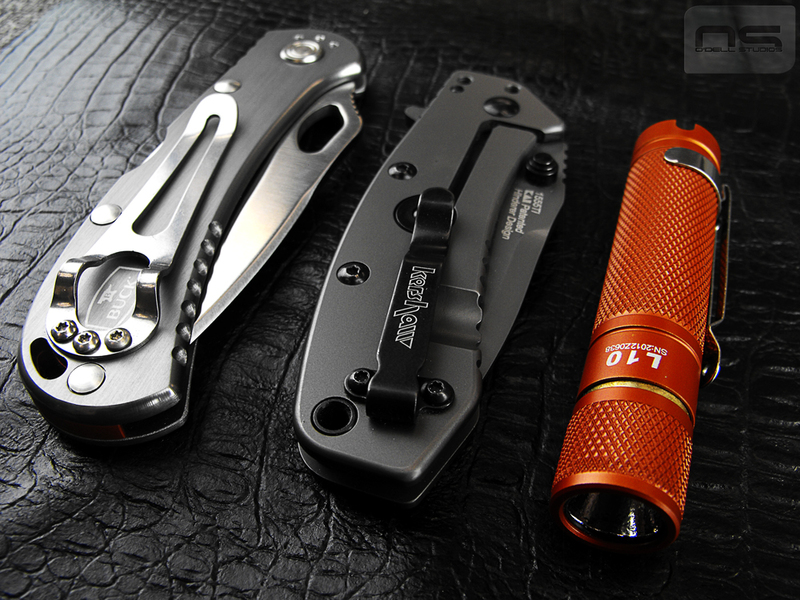 I liked the looks of the knife from the moment I saw it and maybe that drives a lot of the opinion written above, but it only took holding it in my hand to realize that I had accidentally found the perfect EDC knife. I hadn't realized the balance of form and function until using it and I've not held a knife that produced that kind of feeling before. 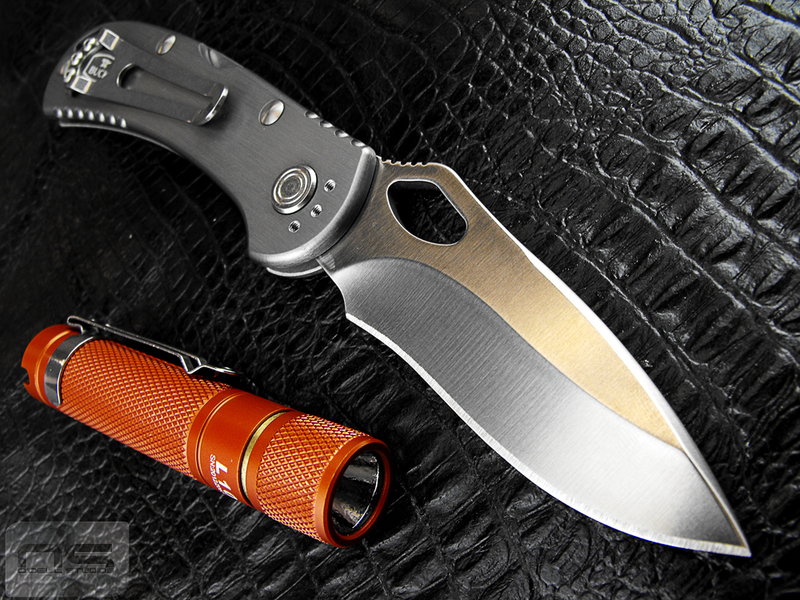 I cannot for the life of me see this knife not becoming one of the most popular pocket knives made today. If Buck offers it in other steels like their Vantage line, they will have every box checked for this style knife. 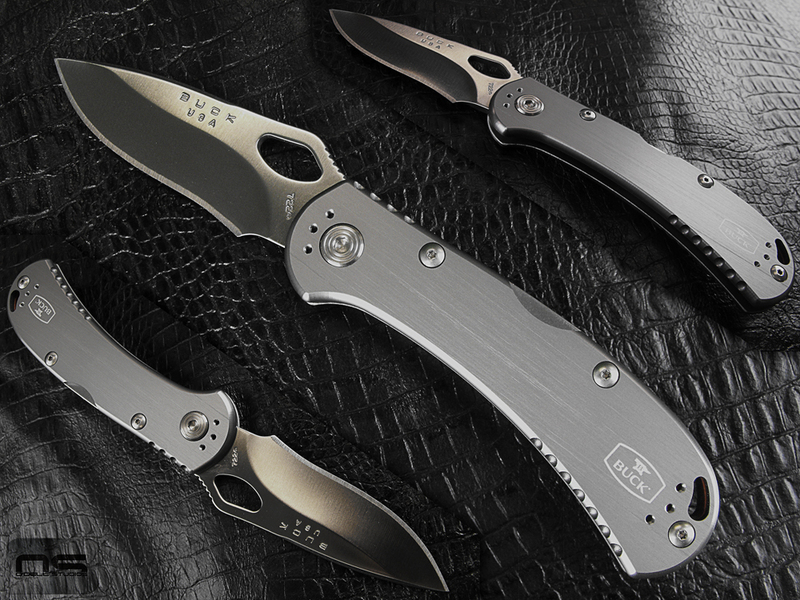 I believe the 722 is worth creating variants, special editions, limited runs, alternate locking systems, blade styles, the works, and while that sort of thing has never interested me before, I might get a couple others if Buck should ever go that route - I like it that well. Please feel free to comment and visit my Tumblr for a few more pictures. Thanks! It seems only fair and right that any review also include the negatives and for sure, I only had good things to say about the Buck Spitfire. I've been carrying it daily since then - which is only a couple more weeks - but I still don't have anything bad to say. But a thirty dollar knife can't be perfect, can it? Every review or thread I've read or watched has said something about blade play. Mine has the same issue. At first this was reason enough for me to want to wait until it had been out longer. I'm glad I didn't wait. The blade play is difficult to describe but it is "up" only, not side-to-side and not up-and-down, just up. It would appear, upon close inspection, that the blade and pivot and the lock can all move very slightly upward when you apply downward pressure on the edge. Yes, I am saying I can actually see the pivot move as if the hole it rides in is not a perfect fit. What does it mean, is it bad? Personally, I just don't think hard use was a part of this knife's design, so my opinion is, this isn't a real issue. Ultimately I will be curious to see if Buck sorts it out. 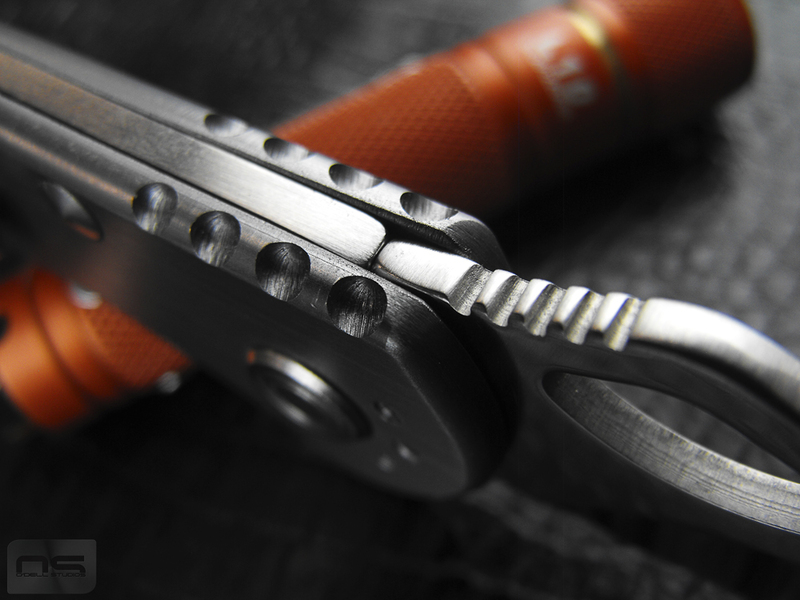 I am sure there is some compromise that must be accepted when you create an easy opening lock-back, however, I suspect Spyderco gets it right with theirs and it's obvious that there is heavy Spyderco influence in the Spitfire. Minor fit and finish issues are present which are completely unfair to address at the price point but for that same reason, worth talking about and I'll explain why. One thing to keep in mind is that macro photographs show imperfections you simply don't notice with the naked eye without white-gloving every millimeter of the product, but there are still a couple. You may have noticed a deep scratch in one side of the handle - deeper than the other "brushed" scratches that is. The spine of the blade at the jimping isn't perfectly square, and well, I can't think of anything else to complain about. Oh yeah, the swedge isn't perfectly centered. But yesterday I noticed something interesting. I saw some nicely taken close ups of Emerson knives. In case they weren't expensive enough, they were also "customs" in one fashion or another, and I noticed something. These knives are 10 or 15 times the cost of the Buck (at least), let's keep that in mind and I have no idea what the extra custom work cost. But, since we had nice close-ups I was also able to see those imperfections that macro photography reveals. The pivot sides of the blades were still rough from where they were either machined from stock or stamped. I don't know how these blades are made but I could see tool marks. If you look very closely at my photos of the Spitfire, you can also see very light marks in the same area - the rear of the blade where all the pivoting and locking happens. For the most part this is hidden but I noticed on my knife someone had taken at least a second to clean those tool (or stamping) marks up just a bit. In fact, even the inside of this knife has been touched. The lock bar is almost completely smooth finished inside and out. I also pointed out earlier the polished lock contact surface and even though it's part of the function of the knife, how can a knife costing 10 times more, NOT have completely perfect surfaces? What's more I noticed areas in these pictures where the scales on these Emersons weren't flawlessly fit to the liners and bolsters (on liner lock knives). To me, that's unacceptable. I am good with paying more for better steel and physically stronger knives for people who use them, but as with most things that are over priced, you are dealing with massive diminishing returns beyond that. For a hard use knife I will pay more for steel and strength, but there is no way you are getting 10 or 15 or 20 times either of those with high end production knives. So what makes up the bulk of the balance? Well, handle materials and fit and finish. Micarta isn't special, it just isn't, and obviously the fit and finish of the examples I was looking at wasn't anywhere near worth the money spent. 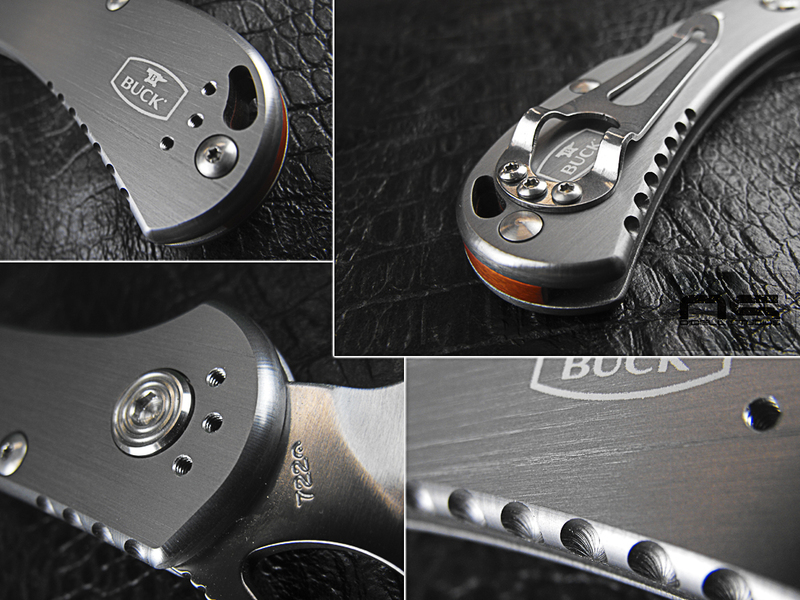 This is why fit and finish is worth talking about when it comes to the Buck Spitfire. The bottom line is that for $100 you might get 3 times the steel and strength but at $400 or $500 you are getting very little for the extra coin. As with anything I consider high value, I must get more value than I paid for so paying many multiples while getting less and less with each one is the opposite of what I am looking for as a consumer. My philosophy for how products should be made is probably becoming clear from my other posts but it's simple. Skip on the stuff that doesn't matter and deliver on the things that do. The Buck Spitfire is not just a perfect example, but delivers more than it had to for the coin exchanged. And I believe this is officially my most epic review! Thirteen images, some of which are multiple images! OK no bragging. In fact, that might not be worth bragging about. 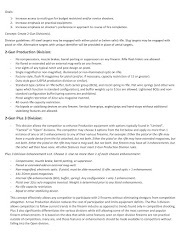 Reading and scrolling online gets old so I hope that the bits of text accompanying the images get the gist of it across so that you can skip the rest and for those who like reading in depth, I hope I have provided for you as well. Thanks for getting this far and thanks for visiting. Now go get yourself a Spitfire.